President Recep Tayyip Erdogan is taking an increasingly defiant stand, imposing tariffs on imports of US cars, cigarettes and alcohol and recommending citizens replace their iPhones with non-US phones. The situation has deteriorated beyond being reversible by raising interest rates. Approaching the IMF looks out of the question. Capital controls are being mooted. 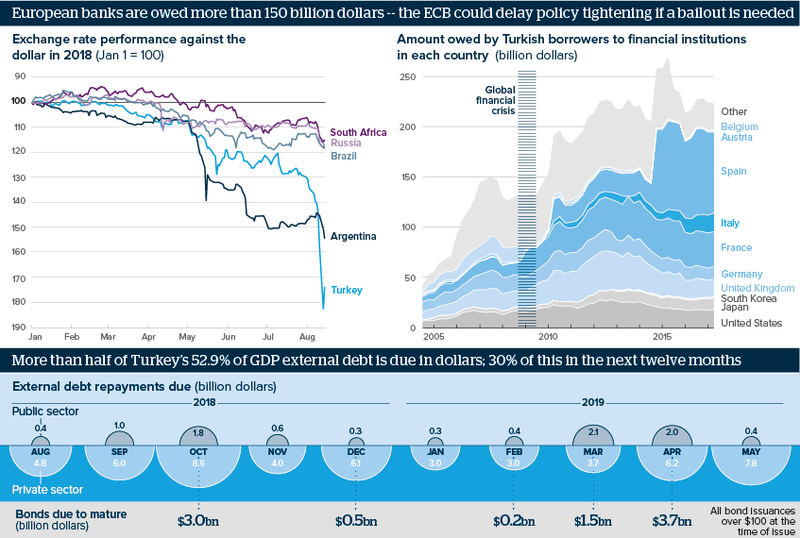 They would stop savings escaping abroad, but they would not solve Turkey’s over-reliance on portfolio inflows, which financed nearly 20% of the 7.9% of GDP first-quarter current account deficit and over 50% of last year’s 5.5% deficit. Controls or no controls, descent into recession is likely; internal and external policy will determine the pace. A firm Turkish-Qatari alliance -- Qatar pledges 15 billion dollars of investment -- will aid investor confidence.Turkish borrowers owe Spanish banks over 80 billion dollars , French banks over 35 billion and Italian banks over 18 billion.Erdogan may seek to use the crisis to move the economic system away from a Western model towards an Islamic one.China will be eyeing investment opportunities but geopolitical risks could make officials cautious.Vulnerable emerging market currencies are down, but better buffers mean the risk of widespread contagion is lower than 10-20 years ago.